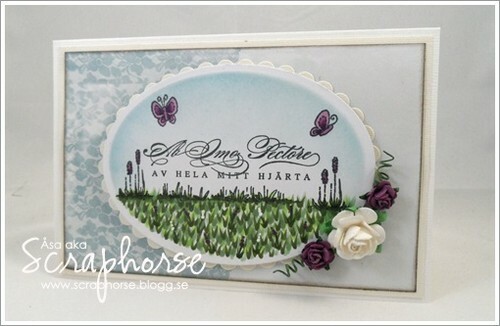 Today Im going to show my last card as a guset designer for Pysselmyran and there wonderful Fairytale stamps. For this card I have concentrated to focus on the many little, but very fun and useful, accesories stamps. I kept the card very clean and Simple. Just using little tricks like 3D-dots and distressing to make it pop. I have colored it with Copics. 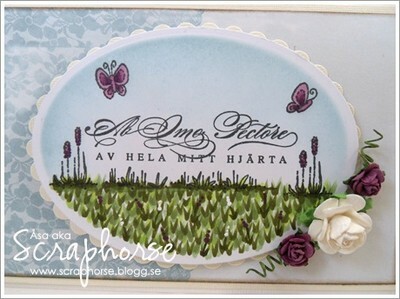 I wan't to say Thank You to Sofia, giving me the great opportunity to cteate with her wonderful stamps! I love this pink/brown twine combo and the card is gorgeous with Heartsy Mae as the star!